Tollywood Bengali film Chitrangada movie story review casting director producer cast of Chitrangada release date book buy tickets online Bengali Chitrangada Jishu & Rituparno Ghosh, pictures wallpapers download mp3 songs Chitrangada Jishu & Rituparno Ghosh, Bengali movie review plot shooting location cinema halls showing Chitrangada Kolkata Bengal show timings upcoming Bengali cinema Chitrangada watch online details information. Film-maker Rituparno Ghosh is back with a blast. This time renowned film-maker Rituparno Ghosh will also be seen doing lead role in his new Bengali film Chitrangada - The Crowning Wish featuring Jishu Sengupta, Anjan Dutta, Dipankar Dey & others. Shree Venkatesh Films has produced the Rituparno Ghosh directed Chitrangada Film which releasing on 31st August 2012, after a long seven years gap. • Chitrangada Bengali movie Story Writer & Director Name: - Rituparno Ghosh [Assistant Director Name is Sanjoy Nag]. • Chitrangada Bengali movie Producer name: - Shree Venkatesh Films. • Chitrangada Bengali film Casts Actors Actresses: - Rituparno Ghosh, Jishu Sengupta, Dipankar Dey, Raima Sen, Anusuya Majumdar, Koushik Bandopadhyay, Anjan Dutta and many others. • Chitrangada Bengali movie Release Date: - 31st August 2012. • Chitrangada Bengali movie Story Review: - Rituparno Ghosh's Chitrangada film story is a bit different from the Rabindranath Tagore's Chitrangada which is a Dance Drama. 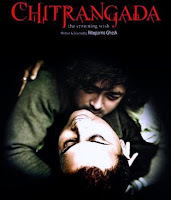 In the Tollywood Bengali Movie Chitrangada, Rituparno Ghosh is playing the character of a Choreographer [character name Rudra Chatterjee (Nick name: Khokon)] who plans to perform Chitrangada Dance Drama on the occasion of Rabindranath Tagore's Birth Anniversary. 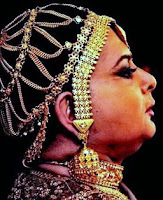 In the film, Rituparno Ghosh became a Choreographer without any support from his father who wanted to make his son an Engineer. While making Chitrangada Dance Drama; Rituparno Ghosh finds the similar situation between father & child relationship [Prince of Manipur & his daughter] that stated by Rabindranath Tagore. Rest of the story, you should watch at your nearest Cinema Hall. • Cinema Halls showing Chitrangada Bengali movie: - The grand premier of Chitrangada Bengali Film will be at Priya Cinema Hall of Kolkata on 31st August [release date]. Now, let's check out few Cinema Hall names showing Chitrangada Bengali Movie in Kolkata & across West Bengal - Nandan-1, Priya, Star Theatre, Jaya (Lake Town, City Mall Barasat), Prachi, Darpana, Purabi, Mahua, Ajanta, Inox [Forum, City Centre, Swabhumi, Rajarhat, Liluah, Burdwan, Durgapur, Siliguri-2], Fame [Southcity, Hiland Park, Hind], Cinemax [Manisquare, Siliguri], Big Cinema, Bioscope (Axis Mall Rajarhat, Junction Mall Durgapur), HDIL Broadway, PVR Avani Mall Howrah, London Paris Ballygunj, Jayanti (Barrackpore), Eylex (Asansol), Chayabani (Barasat), Kairi (Chinsurah), Sanskriti Lokomancha (Burdwan), Rittik Sadan (Berhmanpore) and many others. Advance Ticket booking will begin on & from 29th August 2012. • Check some unknown facts about Chitrangada Bengali Film. New Bengali movie / Tollywood film Chitrangada of Jishu & Rituparno Ghosh seems to be worth watching in Cinema Hall; so start buy tickets online of Chitrangada from www.bookmyshow.com website.